An off-duty Chicago cop has been shot dead while a second man remains in critical condition after a gunman began firing into a parked car in the early hours of Saturday morning. Both men, aged 23, were sat together in the River North neighborhood when two men approached and one began firing a gun into the car in an unprovoked attack. Another man – also an off-duty Chicago police officer – and a civilian woman were in the car as well but were not injured in the attack, police said. The slain officer has been named as John P. Rivera, a resident of the Hegewisch neighborhood on the city’s Far South Side. 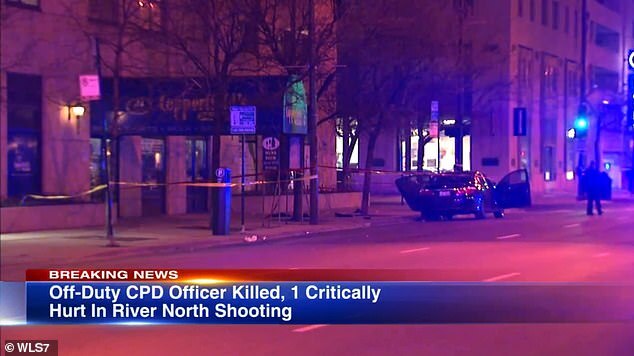 The tragic officer was shot in the mouth, chest and arm, and was pronounced dead at Northwestern Memorial Hospital shortly before 4am, police said. Rivera was just weeks from his second anniversary as a policeman. The Cook County Medical Examiner’s Office said an autopsy was scheduled for tomorrow. 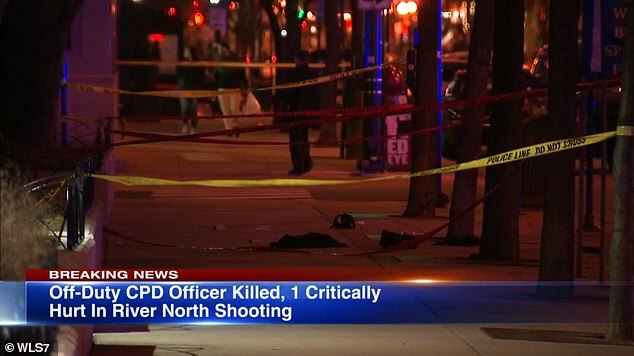 The second man, who remains in critical condition, was shot in the chest and arm and was taken to Northwestern, where he is expected to survive. A manhunt is underway for the attacker who fled on foot. During a press conference outside the hospital, Police Deputy Supt. Anthony Riccio said they were unaware of what could have sparked the shooting. ‘It’s a very fresh investigation,’ Riccio said. Rivera and the attackers had ‘no problems, no words were exchanged, no robbery demand, no carjacking demand,’ Riccio said. Police remain at the scene in Chicago with the area cordoned off while forensic officers gather evidence. 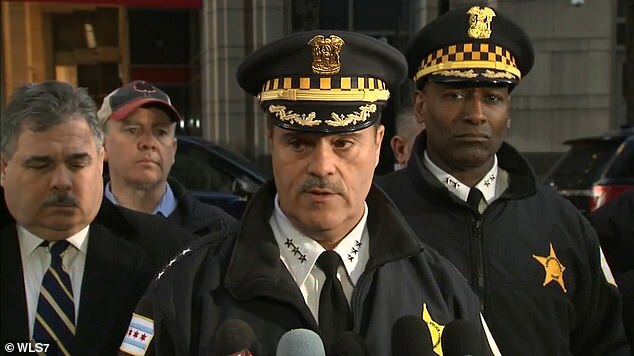 Chief Chicago police spokesman Anthony Guglielmi called the attack a ‘devastating incident,’ and said persons of interest were being questioned. 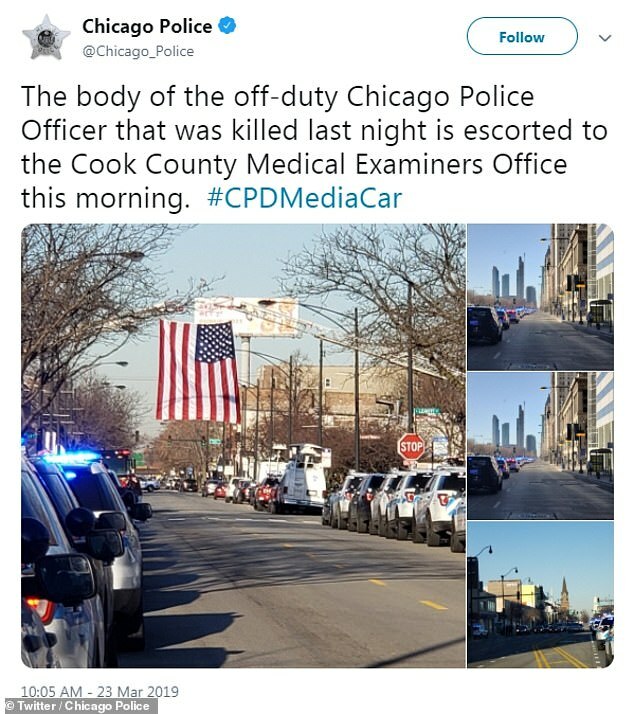 ‘It’s a very sad day, we’re mourning the loss of yet another Chicago police officer,’ said a police union spokesman during the press conference. ‘And yet, we’re going out there later today,’ he said, referring to officers working the beat on Saturday.